This article first appeared on East Niagara Post on February 10, 2015. It is repeated here as I work to put all my book reviews in one place. They will be posted on Thursdays or Fridays and only be altered from the original in that I will add publisher information and pages. Hopefully, by revisiting these reviews, other people might find a book they'd like to pick up for their own enjoyment. This book is historical fiction in the same way that The Da Vinci Code is historical fiction -- light on history and heavy on the fiction. It has all the thrill, mystery, religion, and espionage that Dan Brown’ work does, except that it is set in the Mormon universe rather than the Catholic. Let’s remember here, though, that this is for entertainment, not a valid attempt to record history. The suppositions made by this novel outside the recorded history of the event initially detailed are by the author only to propel her novel. A little actual history first. The Meadow Mountain Massacre was a real event which took place in Utah at Meadow Mountain in September, 1857. The Fancher-Baker wagon train, was coming from Arkansas and heading to new land in California. The Nauvoo Legion, a militia composed of members of the Latter Day Saints, surrounded the wagon train as the emigrants camped at the meadow before continuing their journey. Once the militia had the settlers surrounded, they disguised themselves as Native Americans and attacked the defenseless wagon train. Suspicious that the wagon train member may have accidentally seen the true identity of the attackers, they approach under a flag of truce whereupon they kill almost all the surviving members of the Fancher-Baker party. Of the nearly 140 settlers, only seventeen were spared, all children under the age of seven. In Parks’s work, her novel’s premise is that Mormon founder, Joseph Smith did not actually die in Nauvoo, Illinois in 1844. He escaped from the Carthage Jail and a body double killed in his place. Over the next thirteen years, Smith hides in the shadows, avoiding the man who succeeded him as leader of the church, Brigham Young. Fast forward to present-day. Gwen Marcey is a forensic anthropologist who has been hired by the new interpretive center at Meadow Mountain. It’s her job to reconstruct the faces of the three bodies that were found on the site in order to determine identity. When a woman in a tour group faints upon seeing the facial reconstruction of one of the skulls, it starts a series of mayhem including murder and double crossing. Gwen is fired by the director of the interpretive center after the uproar caused by the fainting woman and Gwen’s irascibility with regard to religious zealotry. Her real adventure begins when she attempts to visit the fainting woman only to find that she has been ritualistically murdered. In the meantime, all her work at the interpretive center is destroyed and one of the security guards is killed in the same style as the woman. When it is discovered that the murdered girl had stolen another girl’s identity, Gwen volunteers to question the parents of the stolen identity girl. She discovers a link to a fundamental branch of the Latter Day Saints. With help from her assistant, she also learns that the ritualistic style of death of the first two victims is tied to the same fundamental group. What are they trying to hide? Gwen is determined to discover the truth. This book is fast paced and will keep you engaged for all 360 pages. While some of the peripheral characters were not fleshed out out to their fullest extent, the main characters were exceptionally well developed. Parks takes her own experience as a breast cancer survivor to define her main character, Gwen Marcey. She offers valuable insights on the disease and its effects that give a far greater depth to Gwen. In addition, her career as a forensic artist is carried over to her character. Carrie Stuart Parks takes a relatively obscure moment from our own history and writes and epic “what if.” She capitalizes on some inconsistencies in the official record and takes off on a tangent. Sure, it’s highly unlikely that Joseph Smith faked his death only to be murdered by order of Brigham Young 14 years later. However, it is a highly entertaining novel that investigates that very notion. It is important to remember that this is for the reader’s enjoyment rather than an attempt to rewrite history. It’s just great fun. 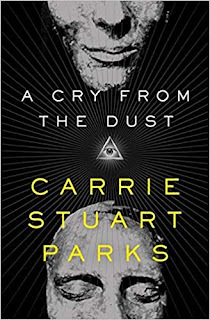 I think it is important to note that this is Carrie Stuart Parks’ first novel. In my opinion, it is very well written, coherent, fun and terrifyingly addictive. I could not put this book down. I was pleased to read on her website that she has a second book due out in August 2015. The Bones Will Speak will continue the adventures of forensic artist, Gwen Marcey. I can’t wait. Craig Bacon loves a well thought out "What If" novel. It keeps his mind wondering. And wondering is what makes us human.